However, while it’s not possible to control external events and how other people react, you can work to build your own resilience and emotional intelligence (EQ) – enabling you to resolve conflict quickly, calmly and effectively without letting it weigh you down. What’s important to understand is that, no matter whether the disagreement is trivial or significant, recognizing and accepting your emotional feelings around the matter is always the first step – it’s then a matter of how you deal with them rationally, rather than swatting them away or feeling embarrassed. 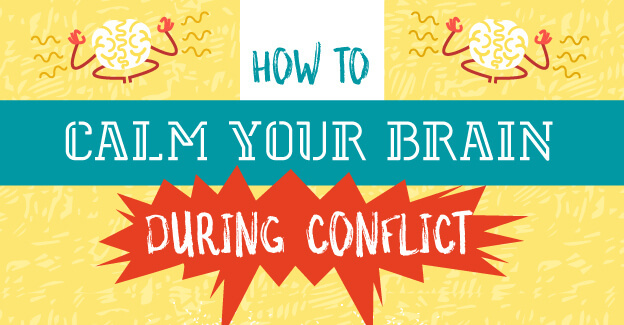 In this new infographic, we show you how taking a mindful approach to conflict can enable you to keep your emotions in check and build the necessary habits and fortitude to constructively manage future disputes. So whether you work in a high-stress, conflict-prone environment or simply want to develop your EQ, you can implement these 6 approaches the next time you find yourself on the cusp of a conflict. Of course, not every confrontation can or will end positively. But, by following these techniques, you’ll be able to deal with conflict rather than avoid it, and all without losing your head.